I chose your company because of the quality of the system and the age of the company. Your company has the experience. We have a 16 by 23 foot crawl space under an addition with a dirt floor & need to make it warmer. We have the joists & sides sprayed with spray foam, but its still cold under the bedroom. Levi and Scott were very professional, and obviously knew what they were doing. They were extremely pleasant and considerate and made absolute certain I was satisfied with the work they were doing. They arrived on time and worked non-stop until the job was completed. After completing the job they made sure every thing was picked up and even swept the driveway. We will properly install a hidden drainage system in your Baldwin basement and completely encapsulate your crawl space with CleanSpace vapor barrier. We are here to solve the problem for you. Unlike the average Baldwin contractor we use completely inorganic, waterproof materials. Even if the basement floods your walls and floors will not be damaged by the water. These waterproof products are patented and are built to create an attractive finished basement that lasts a lifetime. Foundation problems such as bowing foundation walls destroy your Baldwin home’s value and can be dangerous. Our in-house team of structural and geo-technical engineers are here to help. We design and install the right solution and usually have the project finished in less than a week. You will have peace of mind as we provide a 25-year written warranty against defects on our foundation products. The sunken, cracked concrete around your Baldwin home is both an eyesore and a safety hazard. It is also likely to get worse, but we can fix it for you. If you think you might have radon gas seeping into your home, it's time to take action. 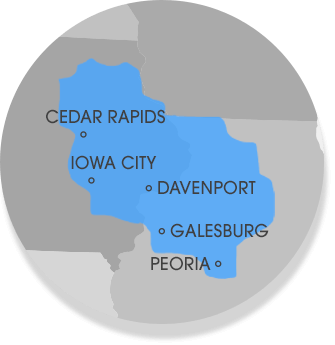 We help homeowners in Baldwin, IA with radon testing, and can even provide a FREE quote for the cost of a radon mitigation system for your home. Steve was having issues with water leaking in his basement and called the experts at MidAmerica Basement Systems to have a waterproof system installed. It was suggested that he install a full perimeter drainage system called WaterGuard. WaterGuard helps collect seeping water from the floor and walls, keeping water from pooling on the ground, and redirects it a sump pump. A TripleSafe sump was installed to discharge all the water that entered the basement, keeping Steve’s basement dry.